Looking for an awesome Bluetooth speaker that won’t break the bank? 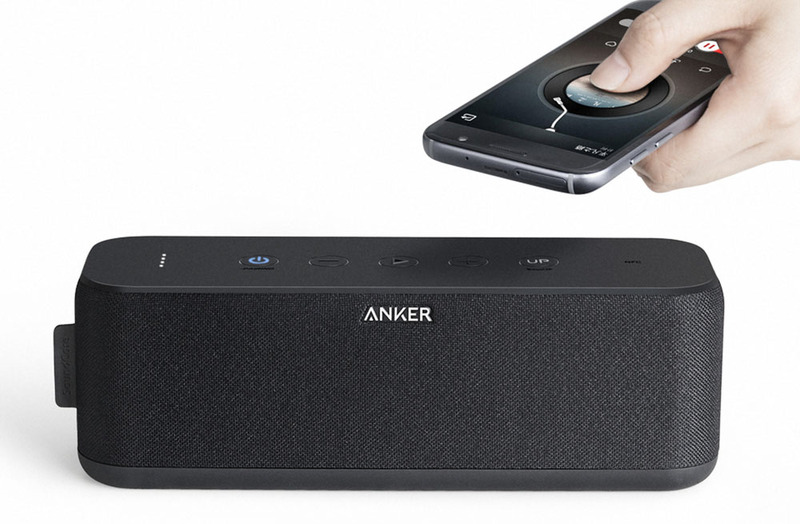 The Anker SoundCore Boost might just be it. This compact device packs in a lot of sound. Not once in the entire time I’ve had the speaker have I had the volume much higher than a few bars on my iPhone – full volume would, I imagine, be deafening. The base boost – which you can toggle on or off by pressing the “Up” button – gives your audio that extra depth without drowning out the treble and mid-sounds. It also sounds sharp and clear, with none of that fuzzy static or shaking speakers. The audio clarity can be attributed to the dual high-performance drivers and twin passive subwoofers. Pairing the speaker to devices is ridiculously easy (as I imagine in the case for many Bluetooth speakers). I tested it with my computer, phone and tablet without any issue (even tried pairing it with our PS4, but it doesn’t support Bluetooth, which is hardly the speaker’s fault). The sound quality was far better than my devices’ audio, which made watching shows on my device is a much better experience. The SoundCore Boost speaker also has a built-in microphone. If you do a lot of video chatting – meetings, catching up with relatives, whatever – this will help. While the website says that it had 12 hours of running time, I found that the battery ran out sooner (around the six or eight hour mark); it could be because I always have the base boost on. So if you want to listen to it for a full 12 hours, turn that off. The Bluetooth range is supposed to be 66’, which it may be outside without any walls to block the Bluetooth waves. I find that, once the device is over 15’ away (and in another room), the connection starts glitching. Audio will break up like a CD skipping (if you’re old enough to remember CDs). It also has an aux input if you want to connect your device the old-fashioned way. The compact design makes it easy to carry. It’s not too heavy, though I wouldn’t want to cart it around all day. It’s also waterproof, a feature I didn’t test out, so you can bring it to the pool or beach without worrying that it’ll be ruined by the water (or rain). Anker provides an 18-month warranty and some great customer support.